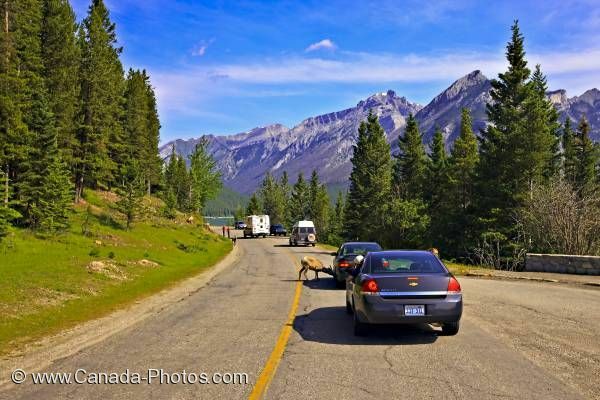 The wildlife which resides in Banff National Park in Alberta, Canada, often causes a disturbance in the traffic passing through, especially during the spring and fall. Along the Lake Minnewanka Loop, cars stop to watch the Bighorn Sheep on the road, one particularly interested in the tires. Bighorn Sheep are plentiful throughout Banff National Park and are often seen along the Lake Minnewanka roads, Bow Valley Parkway, Mount Norquay and near the top of Sulphur Mountain. During the summer, many of the sheep are at higher elevations in the meadows, but the winter season brings the large rams to elevations farther down the mountain passes. Picture of the Bighorn Sheep visiting tourists along the Lake Minnewanka Loop in Banff National Park in Alberta, Canada.